I administer a small network of about 30 mac clients and was not looking forward to upgrading them all to Snow Leopard. Booting each one off of a DVD, running through the wizard that takes forever and then the first boot song and dance that I am sure will be playing in the waiting room for Hell. Then the idea hit me to use Netboot and Apple’s System Image Utility to automate the whole process! 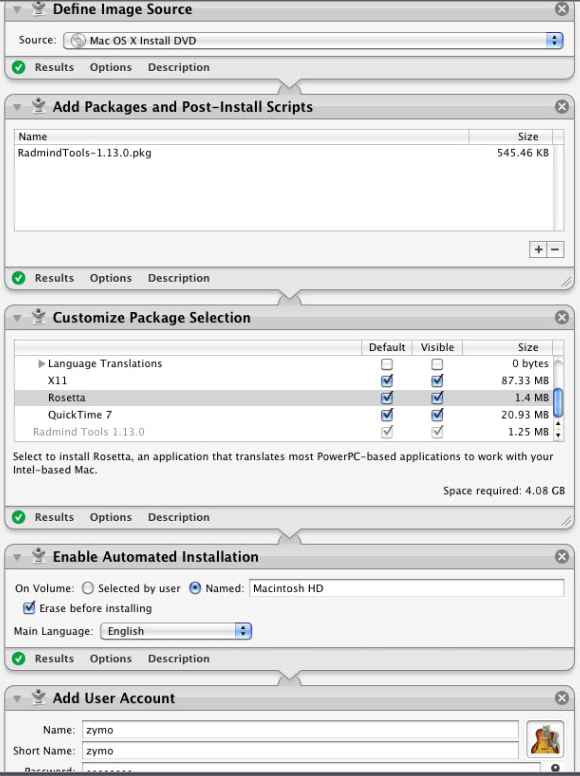 Apple’s System Image Utility (SIU) comes with the default install of Mac OS X Server. Its purpose is to create images that can be used in the NetBoot server. There are three types of images you can create, NetBoot; allows macs to boot over the network from a server-based disk image. NetInstall; installs Mac OS X over the network from a hosted disk image. NetRestore; restores a volume over the network from an Apple Software Restore disk image. We’re going to focus on NetInstall, but more specifically the customization of these images. First insert your DVD of Snow Leopard. Then, open the SIU app and click NetInstall and then click Customize. The SUI window will then turn into an Automator workflow and the Automator Library window should appears beside it. You’ll notice in the Library window there are a bunch of “actions” here. What I want to do is have a workflow that will format the hard drive, change the default packages to install and then setup a user after the install. Once the SUI has completed creating our image then launch Server Admin and enable Netboot and DHCP services. Configure DHCP to hand out address for your network. If you don’t know how to configure DHCP please read up at Apple’s website. Start DHCP and then click NetBoot. From here select Settings and then General. Check off the network adapter(s) that you want to use for serving out NetBoot. The select the Images tab and choose the image we just created as the default, also click the check box labelled Enable. Verify the protocol is set to NFS and click save then start. Note: don’t worry if you don’t have NFS enabled or configure, NetBoot will take care of all of that for you. Now go to your client that you want to install Mac OS X on, turn it while holding down the “N” key. From here you can sit back and relax. Automator Power!